I currently run a weekly open art therapy studio group at the organization where I work. Many people (and clients here) have never heard of the phrase “open art therapy studio.” Generally, there tends to be some confusion about what makes this type of therapy group different from other groups, and what the “open” part is all about. Below is an exploration of this topic and I hope that it helps to answer some of the most frequently asked questions. Open studio art therapy groups usually do not have a set of specific criteria for who may participate. 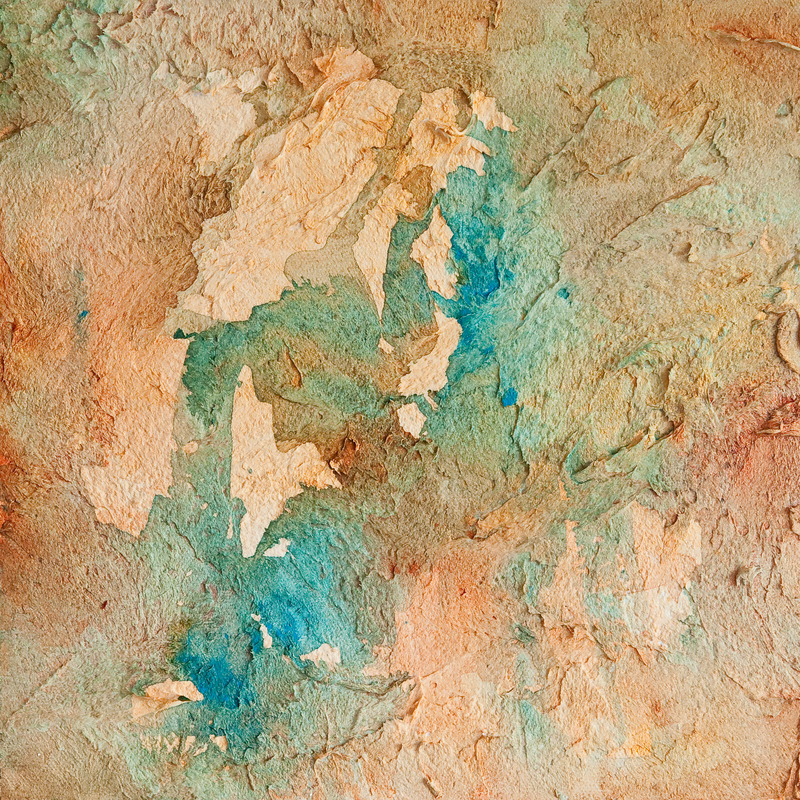 During most open studios, clients choose the materials as well as the theme of the artwork themselves. However there are also open studio groups in which the art therapist provides the group members with specific art therapy directives. 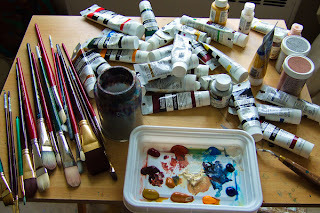 In my current art therapy open studio group, clients do not have to make a commitment to come every week, and new clients can join at any time. 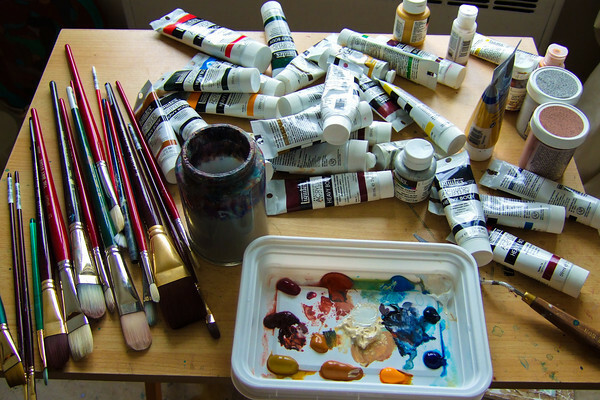 That being said, there do tend to be “regulars” in open studio – clients who show up every week. I always tell new clients that the group composition may continue to shift over time, unlike a closed therapy group. I also remind clients that the same privacy rules apply in an open group as in a closed group. I ask clients to respect each other, and maintain the group’s sense of safety by keeping the personal conversations shared within the room in the group. The physical layout and setup of the studio space sets the tone for the open studio group. If your space has windows, I encourage letting in as much natural light as possible (provided it doesn’t become blinding during part of the day!) I personally cannot stand fluorescent lights, but sometimes they are the only option depending on the facility. If possible, utilize a lamp or two that give off a warmer light. I truly enjoy the ritual of setting out the supplies for that day and arranging them in a way that is enticing and visually interesting. The way you lay out your materials conveys a level of respect for them as well as for the group members. Playing music during open studio is a highly individual decision. Working alongside music therapists has given me a deep appreciation for how much even soft background music can influence the energy of the space. People have highly unique reactions to music, and you should keep this in mind when selecting music. Case in point: I once began an open art therapy studio with some music by Tuck Andress. (He is an incredibly gifted guitar player who creates beautiful music). I had selected the music because I personally found it to be relaxing and inspirational. About a minute into the group I noticed that one of the patients was becoming agitated. I checked in with her to see what was going on. She yelled ” I hate this song!” and ran out of the studio. I stared in amazement at my co-leader, who was a music therapist and my supervisor at the time. Later, during supervision she used this incident to remind me about the power of music and the many different ways it can be experienced by people. (The patient did come back to my next group, and I had learned an invaluable lesson!) This is an extreme example, but one that will hopefully make sense when considering the use of music. Often, music can be a powerful addition to art making during open studio – just utilize it as consciously as possible. During my work in an acute psychiatric unit I had to be more mindful about my selection of materials because of the unit’s rules. For example, “sharps” (exacto blades, scissors, pencil sharpeners) are not generally used in these group settings. If they are used, it is usually done under the supervision of the therapist. Always check with your specific organization’s rules regarding allowable materials. Other examples of materials to check on are: spray paint, certain glues, and permanent markers (which can be abused if inhaled). Some people may feel overwhelmed by a plethora of supplies, while others may feel restricted by a limited selection. Experiment with different approaches and see what feels right. What feels right will change depending on the make-up and needs of the group. I was once told to think of art materials in terms of “food.” Like food, art materials can provide sustenance in the form of creativity. Some people feel compelled to “consume” as many of the materials as possible, and others may show inhibition or “restriction” in their use of materials. There is no right or wrong, but the way in which materials are used most always provides some insight into the art maker. To process the art or not to process? And if it is to be done, during or after? Or both? Some open studio approaches adhere to a “no commenting” guideline when it comes to the artwork. For example, the Open Studio Project in Illinois encourages sharing of the artwork without group feedback. The artist may choose to speak about their own image, and the rest of the group serve as silent witnesses to the piece. Part of the philosophy behind this method of group process is that the silent witnessing frees up group members to be more present and attentive, and generates an atmosphere of respect and safety. In general, my approach to facilitating open studio groups tends to be a blend of methods – consciously chosen to fit the needs of the particular group that day. My preferred style is to allow thoughts and feelings to be shared in an organic way, as they emerge naturally from the creative process. At times I will leave time at the end of group to allow clients to share their work and any feelings that came up for them. I remind everyone that this is not an art class “critique” and encourage others to respond with their feelings and associations, rather than their opinions on the aesthetic quality of the art. Sometimes the sharing is done during the actual creation of the art and unfolds spontaneously. To the outside observer, there may be a question of “where is the therapy?” That is one of the beautiful things about this type of studio process. A skillful art therapist is able to weave together the different pieces and feelings of the group in a cohesive way; respecting each individual’s unique creation while illuminating the common thread running throughout the group. I am constantly amazed by the power of art and its ability to transform individuals within a group dynamic.